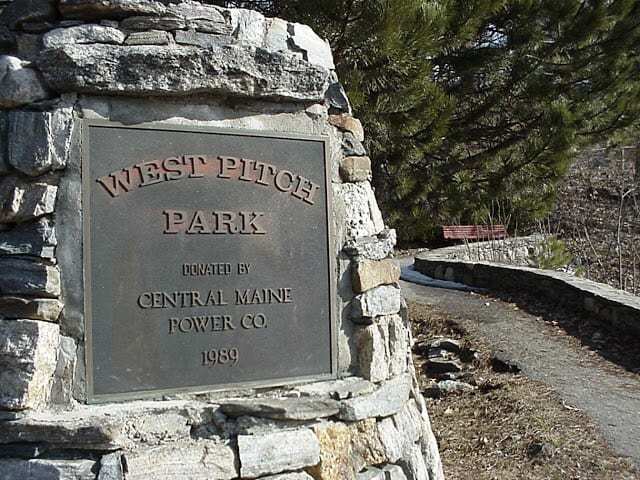 West Pitch Park is located at the northernmost end of the Riverwalk Trail, and looks over the Great Falls, formally known as Lewiston Falls. The West Pitch Park trail is a partially paved path that curves north of the Longley Bridge to the Great Falls. You will see the historic Knight House from this location. There are several benches along the way. The trail is paved to the lookout point where you can see a view of about 175 degrees and five waterfalls. A Gravel path continues to the railroad track and a path continues on the other side. Turn here to loop back to the parking area. The total distance of the trail is a half mile. Directions: West Pitch Park can only be accessed by foot. To do so, walk north on the Riverwalk Trail until the trails end.